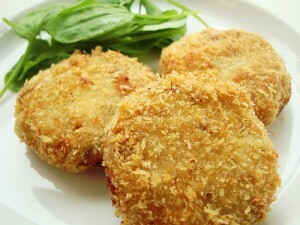 Fish Kabab recipe by Nazia at DesiRecipes.com. 1.Wash the fish pieces with salt and garlic . Then place the fish pieces on a hot griddle (tava) on low heat and sprinkle vinegar on them. When the water dries completely remove from heat and leave to cool. 2. Add all the spices including the fresh coriander and green chilies, mix well to a fairly smooth consistency. Divide the mixture into equal pieces (about 1820), making them into flat round shapes about 1/2 inch thick. 3. Dip the fish kabobs first into the egg and then into the bread crumbs, and deep fry in hot oil. Drain on kitchen paper towel. 4. Serve them hot. Its very good, but if you want to make it simpler, you can used canned tuna instead of fresh fish.